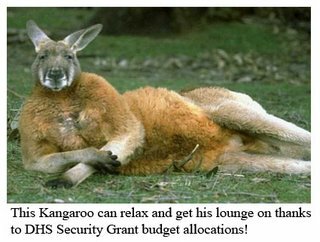 The Good Times Blog: US to Terrorists: "Leave Our Kangaroos Alone!" You may have heard that Washington D.C. and New York City are hoppin’ mad about the recent cuts to their anti-terror funding. A report released on Tuesday, gives some indication of why those cities lost money in this year's budget. An “unreliable” database full of “quirky totals” is being used to “support allocation decision-making processes” at the Department of Homeland Security. The good news is…while the database indicates that New York City has "zero" national monuments or icons”, it has alerted the DHS to threats against an insect zoo and a Kangaroo Conservation Center. I didn't think anyone could want to hurt a kangaroo, but if Osama bin Laden can hate Rotary clubs, maybe I'm wrong? Thanks to Bucket for the tip! Not to be glib, but I would hate to see the results of a bean festival under attack. The data “have been and are currently being utilized to support allocation decision making processes for the department,” wrote Foresman, who oversees the database and the grant funds. I can think of a few other things that may have to mature and improve. Seriously, do you all work? How does everyone have so much time to post on here? Do you get alerts when new posts come up?